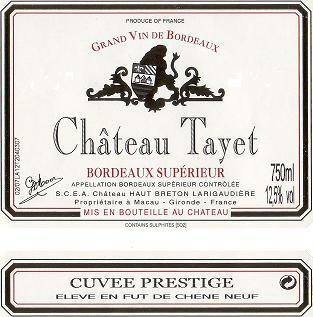 Château Tayet’s present name dates back from 1994. Before that period, the estate was known as Cru de Noë (owned by Raymond fils) and later as Château Les Charmilles. When the owner, M. Marc Raymond, manager of Château Haut Breton Larigaudière, decided to retire in 1993, the De Schepper family took over the management of Les Charmilles, which amounted to 7 hectares at the time. The current managers, the SCEA (Société Civile d’Exploitation Agricole) Château Haut Breton Larigaudière, decided to change the name to “Tayet” because several other estates in Bordeaux have a name similar to “Les Charmilles”. Jacques De Schepper and his general manager, Jean-Michel Garcion, were fully aware of this estate’s potential from the very first moment and have done their utmost to make the most of it. Their goal was to combine the wine’s natural concentration and elegance with the qualities of smoothness and finesse. The estate expanded twice in 1999, and the total area under vine amounted to 10 hectares in 2003. Château Tayet is now château-bottled and Jean-Michel Garcion has made a Cuvée Spéciale since 1994. This wine is barrel-aged (for about 12 months in 50% new oak barrels). Numerous tasters have acknowledged Château Tayet’s great success. Tayet lies on the shores of the French river the Garonne close to the port of Macau. This entity is situated in a quiet framework and our first impression is that time passes by very slowly around here, just like the current of the river, that cannot seem to make up its mind about whether to come or to leave and that glides over the sand with every tide. Steeped by the eternal movements of the water, the vines of this property take advantage of this incredible framework and have produced many magnificent wines for centuries that have been recognised by professionals several times in the past. Our vineyard is ten hectares and is located very close to the designation Margaux. During the 1870s nearly all vineyards in Bordeaux were destroyed by the phylloxera epidemic, the so-called vine louse. Nothing was left, except for the small strip along the river that was preserved and that produced the larger part of the Bordeaux wines during that period. For centuries, every generation of winegrowers has made an effort to produce on these ancient soils, wines with more quality than the previous year. When we started managing château Tayet at the beginning of the 1990s we had one important goal in mind: to refine the wine. Determined to bring this wine to perfection, we went to seek help with our neighbour in Margaux, château Haut Breton Larigaudière with one aim only: to turn château Tayet into a grand wine. The plant density is the most important factor in a vineyard. The less bunches of grapes a vine has, the higher the quality of the remaining bunches will be. Sustainable farming methods are used to prune and all aspects of the green harvest like thinning, suckering and leaf stripping are applied. The production has decreased about 25 % in comparison to the past. The wine-making during which the quality of the grape is taken into account, is followed by the after-care, which takes place in oak barrels (half of which is renewed every year and half of which has only been used once). Our composition of Merlot (55%), Cabernet Sauvignon (40%) and Petit Verdot (5%), contributes to the large complexity of our wine. Then the wine ripes for a period of twelve months, after which it possesses a perfect balance and is ready to please you.